All Products | Canadian History for Kids! This is the print edition of "The Race to Save Canada: The Laura Secord Story." The book is full colour and 69 pages long. This is the print edition of "The Crystal Canoe Caper." The book is full colour and 52 pages long. This is the print edition of "The Legend of the Bronze Poppy." The book is full colour and 56 pages long. This is the print edition of "The Case of Billy the Barrel and the Missing Golden Lantern." The book is full colour and 52 pages long. This is the digital edition of "The Race to Save Canada: The Laura Secord Story." The book is full colour and 69 pages long. This is the digital edition of "The Case of Billy the Barrel and the Missing Golden Lantern." The book is full colour and 52 pages long. This is the digital edition of "The Legend of the Bronze Poppy." The book is full colour and 56 pages long. 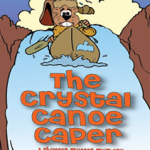 This is the digital edition of "The Crystal Canoe Caper." The book is full colour and 52 pages long.